Gilde Education offers language courses for people who run into problems at work because they cannot read and/or write well enough or because they lack required digital skills. We adhere to the national agreement called “Taalakkoord”, which stimulates employers to improve language skills of employees with low literacy levels. Low literacy is still taboo; people try to hide it. No less than 700,000 employees in our country have trouble reading and writing. This causes problems at work. Not understanding safety instructions and quality guidelines can lead to dangerous situations. Our courses are tailored to the employee’s work situation. Employees who have mastered Dutch perform better and are less likely to call in sick. We also have about 400 people a year who start a civic integration course at Gilde Education. They learn the language and are introduced to Dutch customs and values. Gilde Education offers its students the chance to learn a profession in a company. This helps them learn the language and customs and values of the company. Gilde Education offers more than just classes for everyday-life language. Help your employees reach full potential. Language does not have to be a problem. In need of well-educated employees? Want to prepare for changes in the job market and possible shortage of qualified workers? Learn Dutch for use in daily life. Flyer above is translated here beneath. Do you want to learn the language on level A2? Professional teachers will help you learn the language. You can follow the course during daytime or in the evening. Learn the base of the Dutch language. Flyer above is translated here beneath. 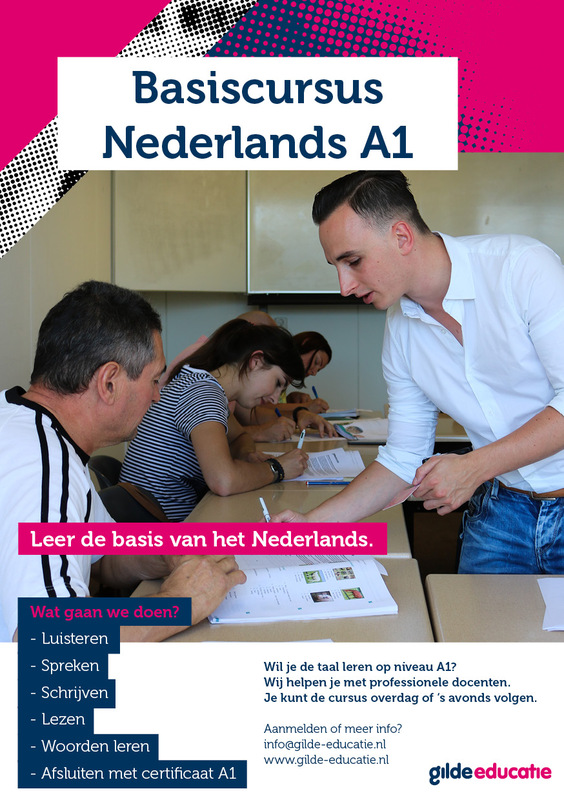 Do you want to learn the language on level A1? Professional teachers will help you learn the language. You can follow the course during daytime or in the evening.